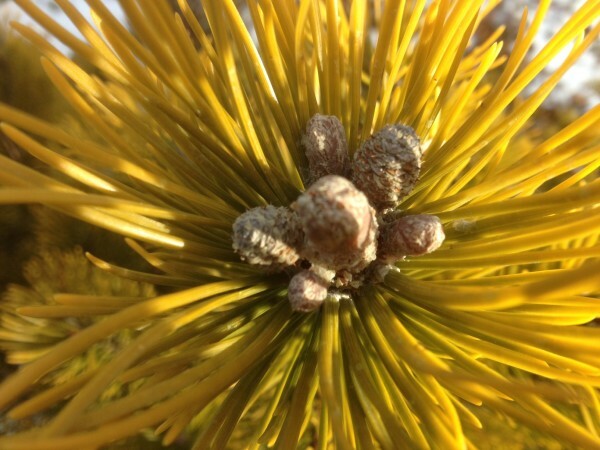 … can be found as part of the Show Garden conifer collection, including this stunner, Pinus mugo ‘Aurea Fastigiata’ (Mountain Pine). Chamaecyparis pisifera ‘Filifera Aureovariegata’ (Sawara cypress) has bright yellow accents, complimenting the green foliage. Pinus sylvestris Aurea Group (Golden scots pine) exhibits its bright golden foliage in the Show Garden. A plant with ‘Aurea’ in its name is basically that golden yellow colour, whereas ‘Aureo’, means there is a border of light or golden colour. … and underneath its protective layer are both seedlings and flower buds, again of Helleborus x hybridus ‘Blue Lady’ (Lenten Rose). In my search for a backdrop of snow I found the seed pods of Amsonia tabernaemontana (Blue star), in the Entry Garden. Another shot of the stem & seed pods of Amsonia tabernaemontana (Blue star) in the Entry Garden – what a great & resilient plant! Speaking of resilience, in the West View Terrace corner bed, the flowers of Helleborus niger ‘Maximus’ (Christmas rose) prove their staying-power. These flowers have survived snowfall, then melt, snowfall, then melt, and now another snowfall! A trend of winters to come?